If you are looking for an alternative gift to give someone who has just had a baby......get them this little pack of memory making magic! I absolutely adore these cards. They are pretty, gender neutral (meaning you could use them for baby No.2 or 3!) 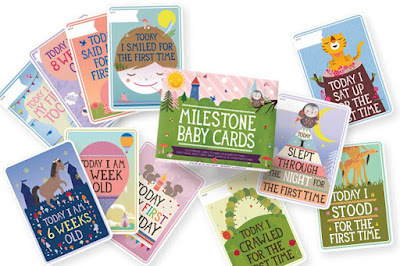 and are such a lovely way of chronicling your little person's big achievements. As they say 'a picture says a thousand words'. The pack includes monthly milestone cards along with once off achievements like rolling, sitting and standing for the first time. I picked these cards up in Boots pharmacy although I have also seen them on Amazon. At €14.99 they aren't the cheapest thing you will pick up but as far as I'm concerned money well spent in the memory making department. When I found out I was pregnant with Luke, I committed to this great idea that I would take photos of myself week by week during my pregnancy and continue when he was born for his first year of life. Fast forward a few weeks to when gruelling morning sickness struck and with that my commitment along with my will to live went out the window. 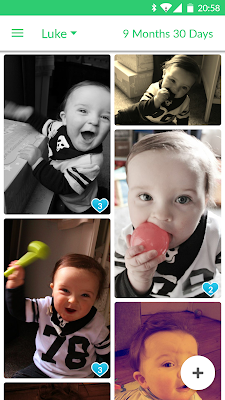 I instead decided to set a more realistic goal of taking a monthly photo (which I set up the same from month to month) so we could monitor how Luke changed in his first year of life. 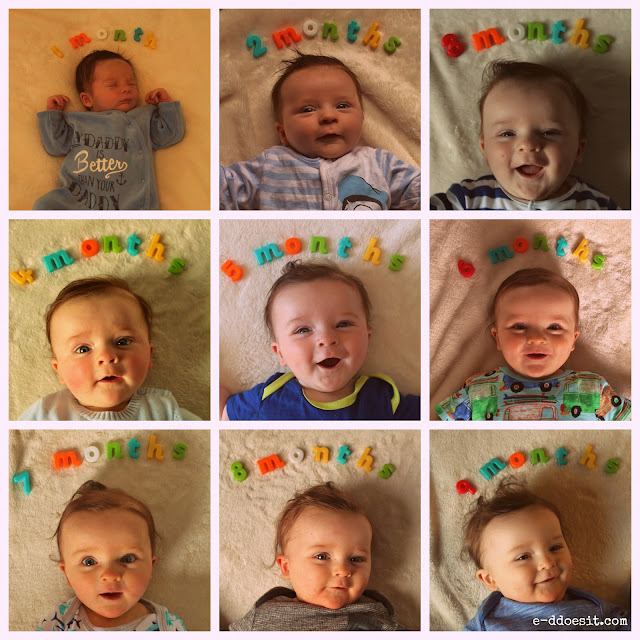 I picked up these magnetic letters and numbers in the early learning centre and with the help of a neutral background in the form of a cream blanket I was all set. I set up the photo the same each month and for his first birthday I plan on picking up a 12 picture wall frame to show off the shots. I love looking at the changes with each picture we take.This has been a really fun task to do with him on the 17th of each month, though I'm sure you can see the older he gets, the more difficult it is to get him to lay still! Lifecake is the app that for me literally changed everything. Made by the clever people over at Canon, Lifecake revolutionises how you can share your personal photos with family whilst keeping them safe and backing them up at the same time. Its basically a timeline from birth. 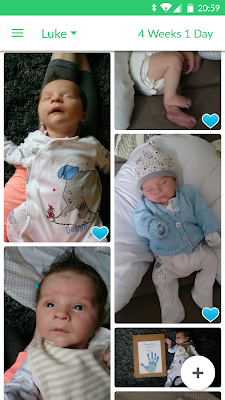 When you add a photo the app recognises what date it was taken and immediately places it in chronological order on your baby/child's timeline. The great thing about this is you can upload old photos in bulk and the app will place them in the correct order for you. You can download Lifecake to your phone, tablet and access it from you PC. It's completely private and only those you personally invite can see your photos. For me this app has been an absolute god send. Between two sets of first time doting grandparents and a brother in Australia, the 'love' and comment features mean that everyone can get in on the baby admiring together! And of course I forgot to mention you can upload videos too. The first 10GB of space are free and then there is a very reasonable annual subscription fee. That said if you invite friends and they sign up and start using Lifecake for their little one you can earn 1GB free space! So make sure to share the love! When taking photos of your little one try and choose neutral non-fussy backgrounds if you can - this will really make your photos all about your baby and not about what's going on behind them. Don't be afraid to use your computer photo editor so you can mix it up with some black/white and sepia shots. Try and pick a date about the same time each month to capture a few special shots. This makes for lovely 'ah remember him then' material and ensures you have a snapshot in time for each month of their first year. Make sure you back up all your photos!!!! I can't stress this enough, particularly if they are on your phone. This may seem obvious but in the age of mobile phones being our go to camera, a lost phone can result in losing a whole lot of memories which would be devastating. If you are not overly organised or committed to being pedantic about backing up your shots then Lifecake will be your perfect solution. I'm sure pregnancy is definitely amazing. I wish i can experience the feeling too. I have been trying to get pregnant for a year and a failed IVF broke me down.